Here we are, smack dab in the middle of summer. Ah, yes! Summer! By simple association, the season evokes images of sunny days, blue skies and sandy beaches. Granted I do not live in the tropics, I will, however further add palm trees, fruity drinks, and dare I say... cabana boys? As I shake myself back to reality, I call upon fond memories of my travels to the Caribbean. Among the endless nights of Latin dancing and jumbo shrimp, I also recall the distinct flavour of coconut water from a freshly picked coconut. This, my friends, is the latest and tastiest essence of Earth's Own Almond Fresh - Coconut. There are so many ways to enjoy the delicious taste of Almond Fresh. Mix it in a smoothie, add it to your cereal, or even bake with it. From pancakes and waffles, to pudding and trifle, Almond-Fresh.com has a myriad of recipes to try. And now you have five flavours to experiment with: Vanilla, Original, Unsweetened, Chocolate and the new Almond Fresh Coconut. 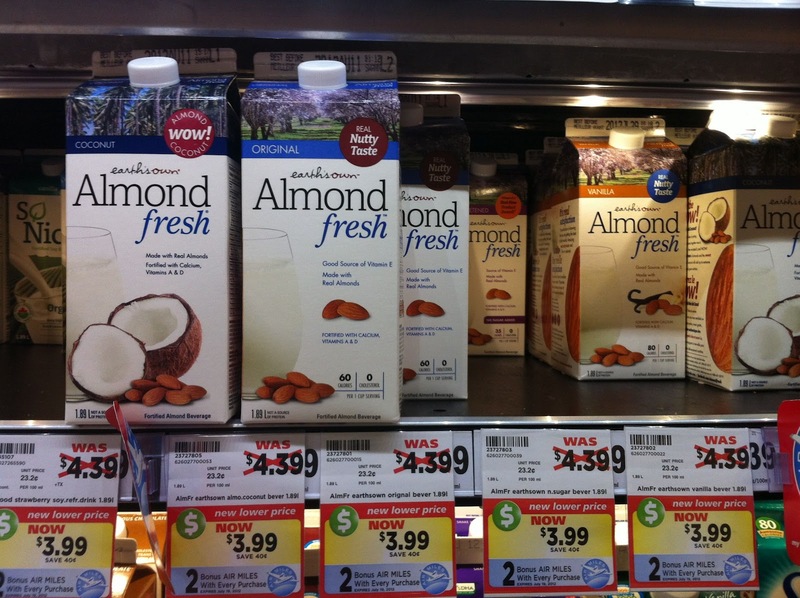 In addition, Almond Fresh has also launched two new product formats: a shelf stable 946ml and a single serve size they call "Almond on the go." It's the perfect size to fit in your lunchbox or to take with you as you head out to the gym, hiking, skiing - virtually anywhere! Not only is Almond Fresh low in calories, one serving provides 45% of your daily recommended dose of vitamin D and 50% of vitamin B12. It does not contain lactose or casein and is wheat and gluten free. And I was also happy to learn that their cartons do not contain BPA. While my husband loves having cereal with Almond Fresh Coconut, my kids are not so keen on it. They much prefer a glass of the chocolate variety. Hmm, I wonder why. I'm sure it has nothing to do with the fact that, like their mother, they absolutely love anything chocolate. My sister-in-law, however, thoroughly enjoys the original and unsweetened varieties. She was drinking Almond Fresh long before I had even heard about it so I knew it was something I had to try out for myself. While on the hunt for the new Almond Fresh Coconut, I was delighted to find them on sale at Metro for $3.99. Plus, you could get two bonus Air Miles with every purchase, though it expired a little over a week ago. I went to a number of stores that carry Almond Fresh such as Sobey's but I have yet to come across it in their single serve. Other stores include IGA Superstore, Whole Foods Market, Highland Farms, Loblaws, and Zehrs, just to name a few. Almond Fresh is owned by Earth's Own - a Canadian company with a passion for health and wellbeing. They have recently created a short survey to help them better understand what you love about Almond Fresh and what you would change given the chance. Your feedback is important and they value your opinions. As such, anyone who completes the Almond Fresh survey will be entered into a random draw for a one year's supply of Almond Fresh beverages. It only took me about five minutes so it's fairly short. Also, Almond Fresh is offering five product vouchers redeemable towards Almond Fresh beverages to one of my Canadian readers. (Approximate value is $20.) To enter for a chance to win, please fill out the Rafflecopter form below. Disclosure: This post was sponsored by Almond Fresh. Any opinions expressed in this post are my own and reflect my family's genuine desire to use their products. I haven't seen No Frills or Walmart listed as one of the stores where it is available. You can view the full list of where it is available on almond-fresh.com . I would love to try the Strawberry one and the Coconut one! I love Almond Fresh because it's so tasty and good for you! I just recently switched to almond milk. Tried Silk first and now I am on Almond Fresh. I use it in my cereal each morning. Surprisingly, my kids and husband like it too! I'd like to try the coconut flavour or unsweetened...can't find either here. I know what you mean. It's not always easy to find but there are five grocery stores all within the vicinity of where I live. So if I happen to be at a different store, I'll be sure to be on a lookout. I don't like to drive to a store just to find a single item. I'd love to try coconut because I love the taste of coconut! I tried the almond fresh vanilla few days ago. It was good! Would love to try the other flavours. I like that Almond Fresh is a soy alternative - I love the taste too! I've tried both the vanilla and the chocolate - much prefer the chocolate. I love the unsweetened Almond Fresh because its such a great alternative to cow's milk; healthier and tastier! I use it to make baked oatmeal and its just so good! We love Almond Fresh -- chocolate for a treat and regular comes in handy when we run out of milk. I like to try the chocolate one. I just love all things Vanilla so I would love to try their Vanilla. My son recently developed an allergy to milk, and milk products, so I have been trying different products. Since he absolutely loves chocolate, the chocolate Almond Fresh might be perfect! The almond Fresh Coconut is new to me, will have to give it a try as I love anything with coconut in it! Sorry to learn of your son's recent allergy discovery. We love milk and dairy products in our home so I can only imagine how difficult it would be to eliminate it from our diet. The good news is that there are many alternatives such as Almond Fresh and for many of them, my children don't notice the difference. Hope you find something your son will enjoy! Been off of dairy (along with my wife) and this is a good alternative for our coffees! I would love to try the chocolate one I love chocolate and coconuts! I haven't tried this brand yet but I'd like to try vanilla because I usually like that flavor best. This might be the best coconut beverage on the market! I would love to try Almond Fresh Chocolate since I'm a huge chocolate lover and am finding that as I get older I'm less able to tolerate regular milk. I haven't tried any yet... but the chocolate sounds good! I would like to try chocolate because chocolate sounds like it would taste yummy.